1.1.1. Augmented reality commonly known as AR is the change or augmentation of what we see and hear. AR is "a way to use technology to redefine space, and it places a virtual layer over the world" (Drell, 2012). AR was the beginning of the virtual over load that is VR. 1.2.1. Virtual reality like augmented does change everything that we see and hear but instead of adding it to the regular devices we use it is a completely new and different piece of technology. Instead of playing video games from your couch on a small 20" tv now you can make it seem as you are physically in the game in the virtual world that is vr. 2.1. Pokemon Go is an Augmented Reality app. It was by far the most successful app of the summer of 2016 and was also one of the first big mainstream app to use Augmented Reality. 2.2. The Augmentation of the app takes place when you find a pokemon on the street and tap it on you screen. As said by the ceo of niantic the creators of pokemon go our games were about encouraging people to go outside and see interesting places,". 2.3. When The pokemon will come up close and will be shown through the camera therefore augmenting the sight that the phone has in that spot. You try to catch the pokemon by throwing the pokeball at it but with the AR in place it seems as if you are aiming for something right in front of you actual positon. 3.1. Like mentioned before if they could improve the battery consumption of the AR many more people including myself would use the AR more often. 4. What I Liked about it. 4.1. For over 20 years now pokemon fans have had to either buy and trade their cards declaring all of the different pokemon that they have or they would have to spend hours on their nintendo walking around the fake universe that lied on the little device but they have finally changed that today. 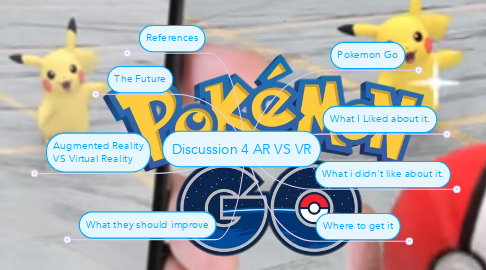 Now we live in the pokemon universe and with the AR in use we can actually see the pokemon around us. We do not have to try to believe that they exist and that we caught them because with the AR it shows us actualy catching them in our front lawn or in the tv room. 5. What i didn't like about it. 5.1. The only thing that i didn't like about the augmentation of the app was that it drained the battery of the phone very quickly making going out for long periods of time difficult. Luckily they had a switch that could turn the AR off so if i wanted to play but didn't have much battery could still go. 6.1. The user population of this app already fell massively due to the lack of new updates by the creators but not because of the AR. Now do i think AR will fall in the gaming industry, yes. The main reason being the rise of VR. Why adjust what you see and/or hear when you can be in what you are seeing, be inside the game. But in many cases AR is the better of the 2. A good example being the housing market one of the largest in the world. There are already concepts showing buyers being able to customize the house to what they want with AR. 7.1. Website: http://www.pokemongo.com/en-ca/ To install the app you must have a smart phone such as an iphone or android and the app is free of charge.